Some of the main representatives of the Buddhist Pantheon, in Musée Guimet, Paris. The Japanese Buddhist Pantheon designates the multitude (the Pantheon) of various Buddhas, Bodhisattvas and lesser deities and eminent religious masters in Buddhism. A Buddhist Pantheon exists to a certain extent in Mahāyāna, but is especially characteristic of Vajrayana Esoteric Buddhism, including Tibetan Buddhism and especially Japanese Shingon Buddhism, which formalized it to a great extent. In the ancient Japanese Buddhist Pantheon, more than 3,000 Buddhas or deities have been counted, although nowadays most temples focus on one Buddha and a few Bodhisattvas. A Japanese mandala of the Five Dhyani Buddhas, and other Bodhisattvas, surrounding the central Buddha Mahavairocana. Early, pre-sectarian Buddhism had a somewhat vague position on the existence and effect of deities. Indeed, Buddhism is often considered atheistic on account of its denial of a creator god and human responsibility to it. However, nearly all modern Buddhist schools accept the existence of gods of some kind; the main point of divergence is on the influence of these gods. Of the major schools, Theravada tends to de-emphasize the gods, whereas Mahayana and Vajrayana do not. By the 9th century under the Pala king Dharmapala, the Buddhist Pantheon had already swelled to about 1,000 Buddhas. 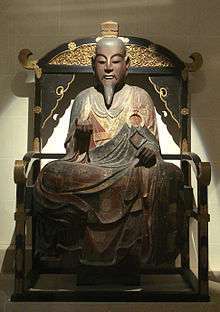 In Japan, Kūkai introduced Shingon Esoteric Buddhism and its Buddhist Pantheon, also in the 9th century. 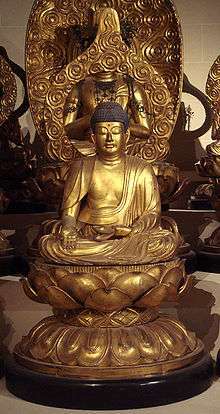 The Buddhist Pantheon in Japanese Buddhism is defined by a hierarchy in which the Buddhas occupy the topmost category, followed in order by the numerous Bodhisattvas, the Wisdom Kings, the Deities, the "Circumstancial appearances" and lastly the patriarchs and eminent religious people. A famous statue group, the mandala located at Tō-ji temple in Kyōto, shows some of the main elements and structure of the Buddhist Pantheon. The mandala was made in the 9th century and offered to Kūkai. A duplicate was brought to Paris, France, by Emile Guimet at the end of the 19th century, and is now located in the Musée Guimet. 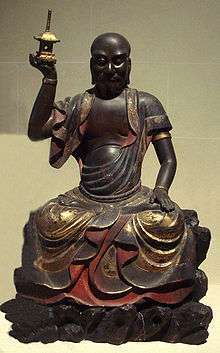 Japanese Buddhism incorporated numerous Shintō deities in its pantheon and reciprocally. 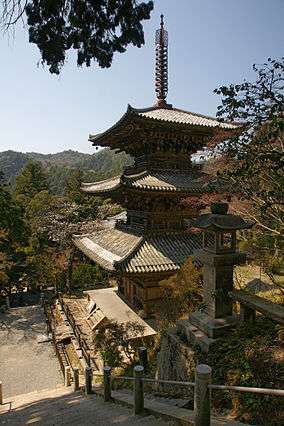 Japanese Shingon also has other categories, such as the Thirteen Buddhas. Zen Buddhism however clearly rejected the strong polytheistic conceptions of orthodox Buddhism. The five Wisdom Buddhas (五仏) are centered around Vairocana (Japanese: Dainichi Nyorai, 大日如来), the supreme Buddha. Each of the four remaining Buddhas occupies a fixed cardinal point. Each of them are a manifestation of Buddha-hood, and are active in different world-periods in which they manifest themselves among Bodhisattvas and humans. The five Wisdom Buddhas, guarded by four Great Diamond Bodhisattvas at the corners. The Buddha at the front is at the South and is Ratnasambhava. These "Dhyani Buddhas" form the core of the Buddhist pantheistic system, which developed from them in a multiform way. At the Musée Guimet, the five Buddhas are surrounded by protective Bodhisattvas. 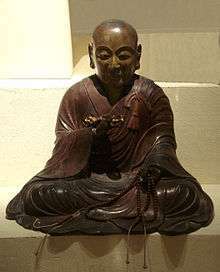 There is also a multitude of other Buddhas, such as Yakushi, the Buddha of medicine. Bodhisattvas are personages who are on the point of entering Buddhahood but postpone doing so in order to help other beings attain enlightenment. 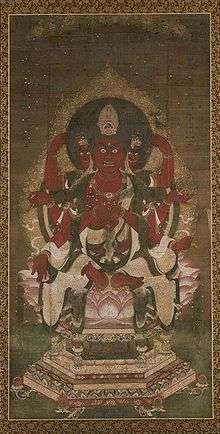 Bodhisattvas are paragons of compassion in Mahayana Buddhism. In the Buddhist Pantheon, besides the past and future Buddhas, there are numerous Bodhisattvas as well. 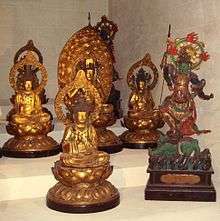 Sometimes, five main "Matrix" Bodhisattvas are determined (五大菩薩), grouped around a central Bodhisattva, Kongō-Haramitsu (金剛波羅蜜菩薩) in the case of Tōji Temple. Five Matrix Bodhisattvas, guarded front right by Heavenly King Jikoku, and back right Heavenly King Tamon. Musée Guimet. Beyond these five main Bodhisattvas, there exists a huge number of other Bodhisattvas, all beings who have postponed enlightenment for the benefit of helping mankind. 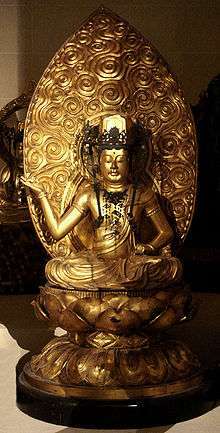 The Wisdom King Gundari is a manifestation of one of the Five Buddhas, Ratnasambhava/ Hōshō Nyorai. 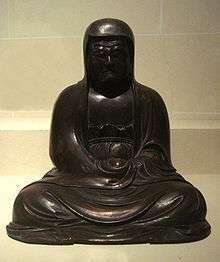 The Wisdom Kings (Vidyârâjas) were initially divinities of Esoteric Buddhism but were then later adopted by Japanese Buddhism as a whole. These Gods are equipped with superior knowledge and power that give them influence on internal and external reality. These Kings became the object of personification, either peaceful in the case of female personifications, and wrathful in the case of male personifications. Their aggressivity expresses their will to get rid of negative forces in devotees and in the world. They are therefore an expression of the Buddha's compassion for all beings. Five Wisdom Kings. 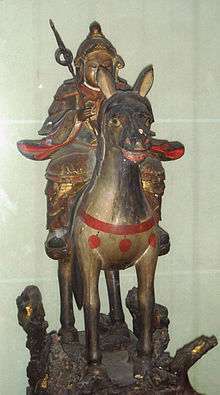 Front left is a protective deity: the Heavenly King Zōchō, and back left another one: Heavenly King Kōmoku. 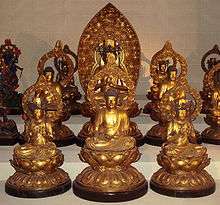 The Five Wisdom Kings (五大明王) are emanations of the Buddhas and protect them. They are usually represented as violent beings. They represent the ambivalent in nature, and seem to derive from ancient Yaksa and Brahmanical tradition. Beyond the five principal kings, numerous other Wisdom Kings exist with a great variety of roles. Many more Wisdom Kings also exist with numerous functions. In general, the Wisdom Kings are viewed as the guardians of the Buddhas and Bodhisattvas. The Heavenly King Jikoku (持国天). Gods, although benefiting from an exceptional longevity, nevertheless are submitted to the cycle of rebirths, and remain outside of the world of enlightenment and Nirvana. They are aiming to reach Nirvana eventually, however, and therefore endeavour to help Buddhism and its devotees. According to Buddhist cosmology, adopted from Indian cosmology, the deities live in the Three Worlds and are positioned hierarchically according to their position in respect to the cosmic axis of Mount Sumeru. High above the mountain resides Brahma, on the summit reside the Thirty Three Gods with Indra as their king, at half-height reside the God Kings of the Orient, and at the bottom inferior deities. Numerous deities are included in the Buddhist pantheon. 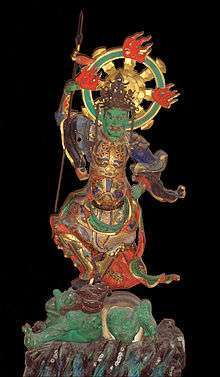 The term Ten (天) is the equivalent of the Indian Deva and designated the higher divinities from the Four Heavenly Kings up. 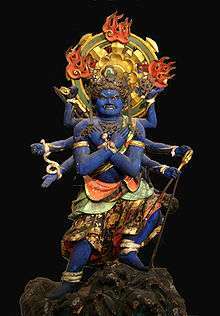 The term Jin (神) designated lower-level deities. The Four Heavenly Kings are an important part of these deities. 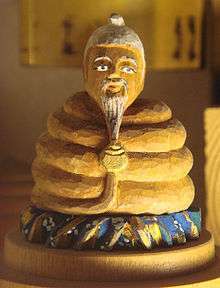 King Nanda, one of the Hachi Dairyūō (八大竜王)/ Nagaraja. Although divinities are considered to be subjects to the law of impermanence, Buddhism nevertheless considers that men should place themselves under their protection. When Buddhism entered Japan in the 6th century numerous Shintō divinities (kami) were also present in the Japanese islands, although they had no iconography. 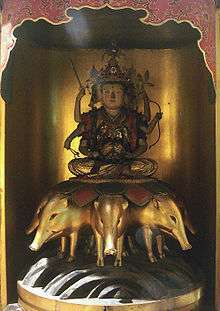 The shuijakushin category is specific to Japan and provides for the incorporation into Buddhism of these Shintō kami. The Buddhist term "Gongen" 権現 or "Avatar" (meaning the capability of the Buddhas and Bodhisattvas to change their appearance to that of a Japanese kami to facilitate conversion of the Japanese) thus came into use in relation to these gods. 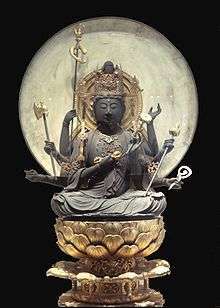 Shintō deities came to be considered as local appearances in disguise of foreign Buddhas and Bodhisattvas (suijakushin (垂迹神, circumstantial appearance gods)). 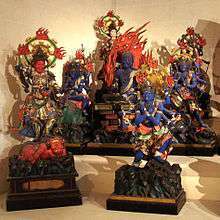 Thus numerous Shinto figures have been absorbed as Buddhist deities. 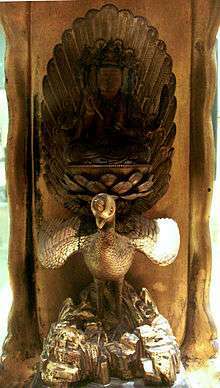 This was also sometimes reciprocal, as in the case of Buddhist Benzaiten and Shinto kami Ugajin. This syncretism was officially abolished by the establishment of the Meiji Emperor in 1868 with the Shinto and Buddhism Separation Order (神仏分離令, also 神仏混淆禁止 Shinbutsu Konkō Kinshi). Circumstantial appearances of Mount Atago (愛宕権現), in the shape of General Jizō. Kompira Daigongen (金毘羅大権現), divinity of the Inland Sea and ships. Sambō Kōjin (三宝荒神), the Fire Divinity. Uses the power of fire for the Buddhist cause. Zaō Gongen (蔵王権現), circumstantial appearance of Mount Yoshino. "Daruma Daishi" Bodhidharma, the founder of Zen Buddhism. Buddhism has also created an iconography for the saint men who assisted to its diffusion. These are historical beings, although some legendary elements can be attached to them. 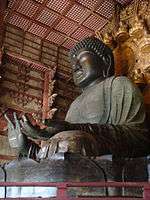 Some, such as Kōbō-Daishi, the founder of Shingon Buddhism, are the subject of a devotion equivalent to that of the Buddhas or Bodhisattvas. Some have also acquired the qualities of protective spirits, such as Battabara protector of the baths, or Fudaishi, protector of monastical libraries. The list of these religious masters consists of men from the "Three Countries" where Buddhism was born and then prospered along the Silk Road: India, China, Japan. The Sixteen Arhats, saint men who were predecessors or disciples of the Buddha, are also part of this category. 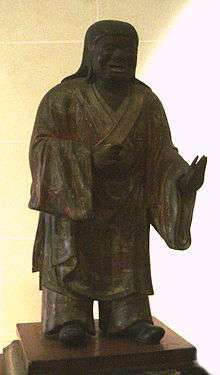 Master Kōbō Daishi founder of Shingon Buddhism. Ingada sonja, one of the Sixteen Arhats. Battabara sonja, 跋陀婆羅尊者, protector of the baths. Fudaishi, 傅大士, an originator of Tendai and Zen, also invented rotating libraries for prayers. Nichiren Shōnin, 日蓮聖人, founder of the Nichiren Buddhism. ↑ Ishii, Ayako, ed. (2008). Butsuzō no Mikata Handobukku (in Japanese). Tokyo: Ikeda Shoten. p. 120. ISBN 978-4-262-15695-8.